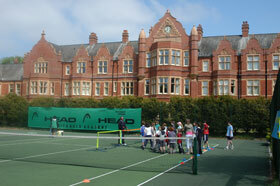 The Parish Council purchased the tennis courts in January 2008. The courts are situated at Charlton Down, in the grounds of Herrison House. There are 2 courts and they are open to any resident of the Parish and their guests. Bookings need to be made at the shop in Charlton Down (in person only please, not by telephone) and the cost is £1 per person (50p for under 16’s). You will be required to leave a £5 deposit for the key. Please note that the courts are situated in Private Grounds and users of the courts should respect that at all times. Access to the courts is by foot from the Private Road to Herrison House. There is no parking allowed in the car parks and on the roadway into Herrison House. Court users should park on the public road or in the Village Square where the shop is located. Everyone using the courts shall book through the booking system in place at the Central store located in the square in front of Herrison Hall Charlton Down. (in person only please, not by telephone). Courts may be booked up to 2 weeks in advance. Fees for use – £1 per hour per adult player and 50p per hour for under 16’s. Bookings will be in 1-hour slots. A £5 refundable deposit is required for the key to the court. If they key is more than 15 minutes late being returned the hirer will lose his/her deposit. The courts shall only be used between the hours of 0900 to 2045 (or dusk if earlier) Monday to Saturday and 1000 to 2045 (or dusk if earlier) on Sunday. PLEASE DO NOT PLAY PAST 2045 OUT OF COURTESY TO RESIDENTS IN HERRISON HOUSE AND THE SHOP STAFF WHO WILL BE WAITING FOR THE KEY TO BE RETURNED. The tennis courts are to be used for tennis only. Cycling, football, skateboarding etc are not allowed on the courts as these activities damage the playing surface. Do not leave the gate open when you leave, as this encourages vandalism. Courts must be locked after use (if the courts are empty). Keys must not be copied or lent to anybody else. Collecting Balls – lost balls may be recovered from the grounds but care must be taken to avoid damage to the plants/shrubs. Waiting – People waiting for others playing/watching must wait at the rear of the court in the area of the bench and not wander (or allow their children to wander) around the private grounds. Noise – Whilst the normal sounds of players enjoying their game are to be expected, players are requested to avoid unnecessary noise which might disturb local residents. Climbing on any of the fences is not permitted. Only suitable footwear to be worn on the courts. All litter is to be taken home. Sitting, pushing or pulling on tennis nets is prohibited. Climbing on, running into, hitting or kicking balls into the nets is prohibited. Please wind down nets after use to reduce the tension and prevent long term damage. Please report any concerns or faults to the Parish Clerk and not to the Village Shop staff.